As the new year begins it brings many important tax-related limits, rates, and deduction updates to be noted. Included below are some of the key items for CCM clients to be aware of. 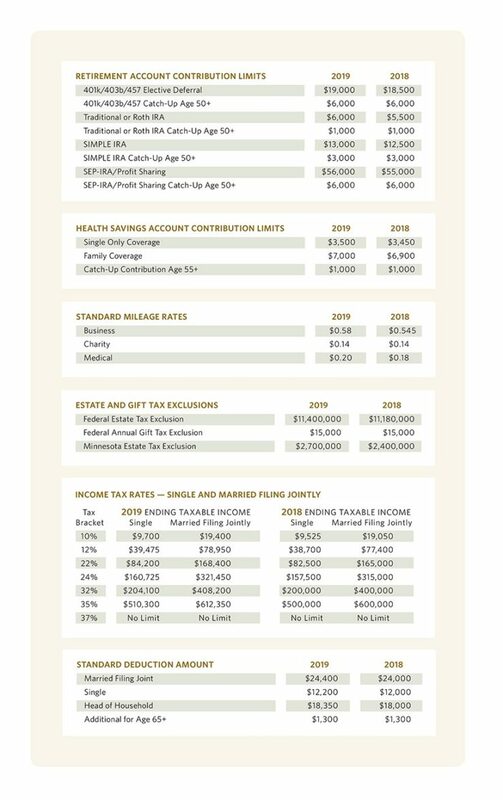 Be sure to contact any member of our Tax Team with questions on how these changes may impact your integrated wealth management planning for 2019 or future years. NOTE: The information provided in this article is intended for clients of Carlson Capital Management. We recommend that individuals consult with a professional adviser familiar with their particular situation for advice concerning specific investment, accounting, tax, and legal matters before taking any action.